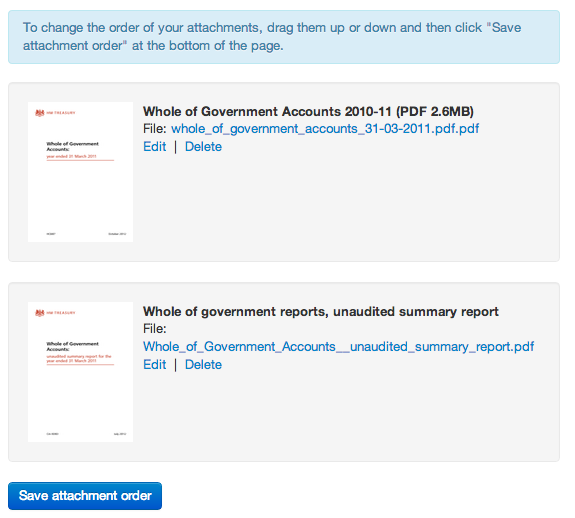 Tomorrow's release of the GOV.UK government app will include the ability to control the order of attachments on a publication page. This has been one of the most requested features by publishers around government, so we're especially excited about putting this live. We hope you'll find the new interface intuitive, but it's a big change so here's a run-through of the main differences. Select the "Attachments" tab to manage attachments, and the "Document" tab to edit all other content of the page. You'll need to save any changes you make on either tab before switching to the other one. Don't worry - a pop-up prompt will appear if you have unsaved changes. An important thing to be aware of is that, when you're creating a brand new document, the attachments tab will not appear until you first complete all mandatory fields and save the draft document. In other words, you can't attach any files until you've created a draft document to attach them to. There's a new button to help you with this, called "Save and continue editing". Use this if you want to carry on editing so you can manage attachments. The attachments tab appears after you've pressed the button. (Or if you're done editing, just use the Save button to save and close the document editing view, as usual). On a news article, detailed guide or statistical dataset, you can place the attachments into the relevant part of the body text using markdown commands. Once you've added some attachments, the reference for each attachment is shown below the body field in the middle of the "Document" editing screen, so you can easily copy the appropriate markdown command and add it to your content. On consultations and publications, on the other hand, attached files are automatically placed onto the page. But now you can control the order in which they are shown. Go to the attachments tab and drag and drop them into the order you want them to appear on the page, and hit save. We'll get around to rolling it out consistently as soon as we can. It's also the beginning of a nicer admin interface for managing documents. We have in mind to split out other parts of the editing screen so that the fields are grouped into more logical steps, and so there's more space for the main text editing window. Paperclips image by The Pitcher on Flickr. Used under Creative Commons. Have you seen the CO's annual report published today?